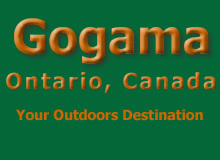 Gogama is an area known for its wilderness and wildlife and is situated in the middle of a vast forest with the nearest city located at a distance of over 100 kilometers. Moose, black bear, wolf, fox, marten, lynx, beaver, muskrat, otter, skunk and weasel are only some of the fur bearing animals that thrive in the area. Hunting and trapping of these animals is regulated by the Ontario Ministry of Natural Resources. Animals are often seen while driving the local roads. 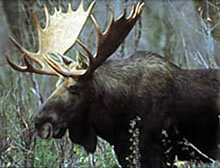 Travelers would be well advised to keep a sharp lookout especially at night, for moose, since these animals are often spotted by the roadside and are unpredictable as to their direction of flight when approached by a vehicle. Their size, akin to a horse makes them dangerous should a collision occur. A wide array of birds from the tiny chickadee to the larger herons and eagles can be found in the region. There are abundant ducks and geese and the area is famous for harboring a large population of partridge. Again, hunting of these and other birds is regulated by the MNR and links to information and licensing will be provided below. Photographic opportunities abound and many a once in a lifetime shot was lost by not having a camera at hand, so be advised to have your equipment readily available. The area has a sizeable trapping community, again regulated and overseen by the MNR. Listed below are some pertinent links .